Created for food lovers and cooking aficionados, Cooking with Keif: A Gourmet Medicinal Marijuana Experience is a Marijuana cookbook that explores using Keif instead of whole Cannabis Buds. Here, Bottjer offers new and tasty options to ingest your medicine in a more sophisticated, refined cuisine opposed to cookies and brownies. 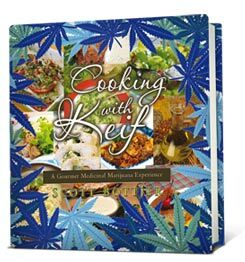 Cooking with Keif opens up a new realm of culinary knowledge to the medicinal user, while showcasing recipes for basic infusions with sauces and soups. Entrées range from old-fashioned Meatloaf and Brown Gravy to Chicken Roulade with a Lemmon Cream Sauce, promising to please any person’s palate. Delicious delectable deserts include Tiramisu and Crème Brulee, among others. Presenting a smorgasbord of uniquely made and mouthwatering dishes, Cooking with Keif: A Gourmet Medicinal Marijuana Experience offers a new caliber of cooking with Marijuana, using finer foods paired with medicinal benefits that eliminate the plant matter aftertaste.